I’ve written about the Tokina 11-16mm many, many times. In fact, I was temporarily banned from REDUser years ago for backhandedly plugging the Duclos 11-16mm conversion – breaking the rules of the forum. I’ve since cleaned up my act (sort of). I speak often of the Duclos 11-16mm, and when I do, I always give credit to Tokina for making such a great product. I wanted to take a post here and acknowledge the original lens, it’s heritage, influence, and evolution over the past (nearly) decade. Around March of 2009 a long standing client brought the lens to our shop and asked if we could bring the lens to a more cinema friendly state. You see, the lens from Tokina lacked a few features that cinematographers required such as a manual aperture. It featured an electronic aperture drive which meant the only way to adjust the aperture was on a Nikon or Canon camera body. Keep in mind, this is back in the RED One days. Arri hadn’t even begun to consider the EF mount, Canon and Blackamagic weren’t in the cinema camera business, and Sony was still banking on camcorders. There were no active EF mounts outside of Canon’s photography cameras. A lot of customers asked us why we decided to go with such an odd little lens as one of our (at the time) biggest undertakings. There are a few key reasons: The only other lens with this kind of focal length on the market (that didn’t cost a small fortune) was the vintage Zeiss 12mm T2.1 which was vastly inferior in almost every way to the quality of the newly designed Tokina 11-16mm. Another reason, and possibly more important, depending on who you ask, is the crop factor of cameras. At the time, many shooters were getting their feet wet in the world of cinema, coming from still photography which used 24×36 Full Frame as their standard. Crop factor was a big issue for the newcomers despite the film industry being completely fine with Super 35mm as the standard for almost a century. Still photographers just being introduced to cinema and the Super 35 format felt they were missing something by cropping down. This left a lot of customers looking for a lens with an extra wide field of view to bring them back to the format they were so accustomed to. The same can be said with shooters using even more severe crop formats like Micro 4/3 which was, at the time, making big waves thanks to the GH3 from Panasonic. 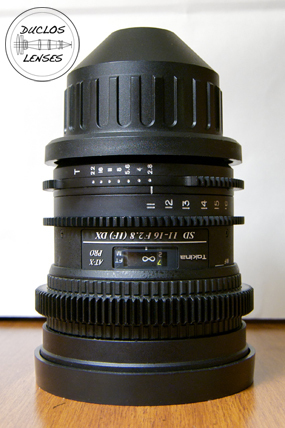 This made the 11-16mm from Tokina an ideal choice to transplant into a cinema housing and fulfill the needs of the industry. This was the very first production model, test built with all of the components (except for the rear baffle), un-anodized. We went on to build hundreds of these units with only a very, very minor revisions throughout production. At one point I had made a one-off model anodized bright red but it was stolen in one of our break-ins years ago which left us all pretty devastated. To celebrate the success of this little project, I decided to do another one-off for myself in 18k gold which sits in the Duclos Lenses lobby to this day. A treat to look at and hold, but completely impractical. Throughout the production life of our 11-16mm conversion, we always acknowledged the fact that we were simply rehousing a Tokina lens. Tokina deserves all the credit. They are the ones that made an amazing product and provided the foundation for our project. Despite our success with the product, Tokina was never directly involved. We purchased genuine US stock from dealers all over the country and rejected any lenses that didn’t meet our standards. We continued to see pretty good sales and compliments all around with the quality of the product we were offering. The real compliment came about in 2014 when Tokina themselves unveiled their very own cinema version of the 11-16mm, shown originally at NAB in Canon EF mount only. In fact, it wasn’t really that impressive at all. It was pretty much the same lens, but with a focus gear added to the focus barrel and a few different markings – a “V” presumably for “Video”. Tokina was quickly learning during this time. Shortly after announcing the development, they made adjustments and revised the housing to include an external focus scale and improved the body with aluminum components which is essentially the product you would get today. Orders began shipping late 2014 in Canon EF and Micro 4/3 mount. Tokina began offering the lens in a PL mount late 2015 as well as Sony E mount which brings us to the current line and Tokina’s foray into the world of cinema lenses. As of today, the Tokina 11-16mm is available in several mounts which incorporate two different versions, but all based on the same optical design. The Canon EF, Micro 4/3, and Sony E mount all use the same body style (left) which can be identified clearly by it’s colorful markings and bayonet front. The PL mount version uses a slightly different housing that leaves out the bayonet front in favor of a clean 80mm diameter suitable for clamp-on accessories. The markings are a bit more reserved with plain white engravings except for the metric distance marks in yellow. The functionality, performance, and price of the Tokina Cinema 11-16mm effectively torpedo any attempt at rehousing. I don’t say this with any animosity at all. I’m treuly flattered that our small project had such a profound impact on the industry and provided Tokina some insight into their own future. As of last month, Duclos Lenses officially discontinued the production of the 11-16mm PL to make room for the genuine Tokina Cinema model. I believe it’s fair to say that the 11-16mm has been a pivotal product for Tokina. It’s truly paved the way for them to learn and grow as a company in the very competitive world of motion picture lenses. Founded on the success of this single lens, Tokina has been able to introduce several cinema lenses including a pair of zooms: 16-28mm T3 and 50-135mm T3, as well as a 100mm Macro prime lens and several cinema oriented accessories. Just this year, Tokina announced the development of their brand new cinema prime lenses which are poised to offer excellent image quality with a state-of-the-art optical design. We’ll be doing some additional posts specifically on the new Tokina products and hopefully with some exclusive content so check back soon! I love this blog! I didn’t realize the history that went along with this lens. 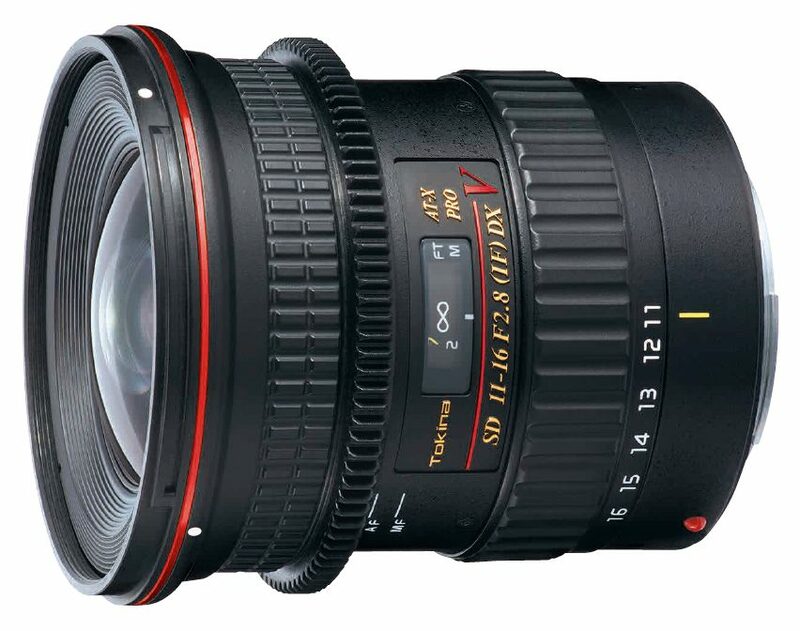 Seems like “cinema style” lenses with manual focuses and rings etc are becoming more affordable. I’m particularly interested in the Angénieux ez series because of the focal lengths. Do you think Tokina will ever make a 30-90 range? I had the chance to talk to a Tokina engineer at InterBee 2016 in Japan. When pressed about a lens in the 28-70 range, he gave the impression they were working on it right now. I’m also looking forward to this as I have their 16-28 T3 and it has a lovely image and no breathing.